The promise of the Green Revolution was that it would end hunger through the magic of chemicals and genetic engineering. The reasoning goes like this: the miracle seeds of the Green Revolution increase grain yields; higher yields mean more income for poor farmers, helping them to climb out of poverty, and more food means less hunger. Dealing with the root causes of poverty that contribute to hunger takes a very long time – but people are starving now. So we must do what we can now – and that’s usually to increase production. The Green Revolution buys the time Third World countries desperately need to deal with the underlying social causes of poverty and to cut birth rates. Today, though, growth in food production is flattening, human population continues to increase, demand outstrips production; food prices soar. As Dale Allen Pfeiffer maintains in Eating Fossil Fuels, modern intensive agriculture – as developed through the Green Revolution – is unsustainable and has not been the panacea some hoped it would be. Technologically-enhanced agriculture has augmented soil erosion, polluted and overdrawn groundwater and surface water, and even (largely due to increased pesticide use) caused serious public health and environmental problems. Soil erosion, overtaxed cropland and water resource overdraft in turn lead to even greater use of fossil fuels and hydrocarbon products. More hydrocarbon-based fertilizers must be applied, along with more pesticides; irrigation water requires more energy to pump; and fossil fuels are used to process polluted water. And the data on yields, and fertilizer and pesticide use (not to mention human health problems) supports these allegations. A study by the Union of Concerned Scientists called “Failure to Yield” sums it up nicely. (click here). So is a reprise of the green revolution—with the traditional package of synthetic fertilizers, pesticides, and irrigation, supercharged by genetically engineered seeds—really the answer to the world’s food crisis? As Josh Viertel, president of Slow Food USA, describes it: the good news is that feeding the world in 2050 is completely possible; the bad news is that there isn’t a lot of money to be made by doing so. It has become clear that agriculture has to shrink its environmental footprint – to do more with less. The world’s growing demand for agricultural production must be met not by bringing more land into production, with more gallons of water, or with more intensive use of inputs that impact the environment, but by being better stewards of existing resources through the use of technological innovation combined with policy reforms to ensure proper incentives are in place. A massive study (published in 2009) called the “International Assessment of Agricultural Knowledge, Science and Technology for Development” concluded that the immense production increases brought about by science and technology in the past 30 years have failed to improve food access for many of the world’s poor. The six-year study, initiated by the World Bank and the UN’s Food and Agriculture Organization and involving some 400 agricultural experts from around the globe, called for a paradigm shift in agriculture toward more sustainable and ecologically friendly practices that would benefit the world’s 900 million small farmers, not just agribusiness. As the report states: “business as usual is no longer an option”. We began this series a few weeks ago with statements from several people who said that organic agriculture cannot feed the world. Yet increasing numbers of scientists, policy panels and experts are suggesting that agricultural practices pretty close to organic — perhaps best called “sustainable” — can feed more poor people sooner, begin to repair the damage caused by industrial production and, in the long term, become the norm. This new way of looking at agriculture is called agroecology, which is simply the application of ecological principles to the production of food, fuel and pharmaceuticals. The term is not associated with any one type of farming (i.e., organic, conventional or intensive) or management practices, but rather recognizes that there is no one formula for success. Agroecology is concerned with optimizing yields while minimizing negative environmental and socio-economic impacts of modern technologies. The report calls for investment in extension services, storage facilities, and rural infrastructure like roads, electricity, and communication technologies, to help provide smallholders with access to markets, agricultural research and development, and education. Additionally, it notes the importance of providing farmers with credit and insurance against weather-related risks. The majority of the world’s hungry are smallholder farmers, capable of growing food but currently not growing enough food to feed their families each year. A net global increase in food production alone will not guarantee the end of hunger (as the poor cannot access food even when it is available), but an increase in productivity for poor farmers will make a dent in global hunger. Potentially, gains in productivity by smallholder farmers will provide an income to farmers as well, if they grow a surplus of food that they can sell. As an example of how this process works, the UN report suggests that “rather than treating smallholder farmers as beneficiaries of aid, they should be seen as experts with knowledge that is complementary to formalized expertise”. For example, in Kenya, researchers and farmers developed a successful “push-pull” strategy to control pests in corn, and using town meetings, national radio broadcasts, and farmer field schools, spread the system to over 10,000 households. The push-pull method involves pushing pests away from corn by interplanting corn with an insect repelling crop called Desmodium (which can be fed to livestock), while pulling the pests toward small nearby plots of Napier grass, “a plant that excretes a sticky gum which both attracts and traps pests.” In addition to controlling pests, this system produces livestock fodder, thus doubling corn yields and milk production at the same time. And it improves the soil to boot! Further, by decentralizing production, floods in Southeast Asia, for example, might not mean huge shortfalls in the world’s rice crop; smaller scale farming makes the system less susceptible to climate shocks. If you read the story by Justin Gillis in the New York Times on May 5, which discusses the effects climate change is having on crop yields, this can only be a good thing. Significantly, the UN report mentions that past efforts to combat hunger focused mostly on cereals such as wheat and rice which, while important, do not provide a wide enough range of nutrients to prevent malnutrition. Thus, the biodiversity in agroecological farming systems provide much needed nutrients. “For example,” the report says, “it has been estimated that indigenous fruits contribute on average about 42 percent of the natural food-basket that rural households rely on in southern Africa. This is not only an important source of vitamins and other micronutrients, but it also may be critical for sustenance during lean seasons.” Indeed, in agroecological farming systems around the world, plants a conventional American farm might consider weeds are eaten as food or used in traditional herbal medicine. States and donors have a key role to play here. Private companies will not invest time and money in practices that cannot be rewarded by patents and which don’t open markets for chemical products or improved seeds. The flood-tolerant rice mentioned above was created from an old strain grown in a small area of India, but decades of work were required to improve it. But even after it was shown that this new variety was able to survive floods for twice as long as older varieties, there was no money for distribution of the seeds to the farmers. Indeed, the distribution was made possible only through a grant from the Bill and Melinda Gates Foundation. American efforts to fight global hunger, to date, have focused more on crop breeding, particularly genetic engineering, and nitrogen fertilizer than agroecology. Whereas the new UN report notes that, “perhaps because [agroecological] practices cannot be rewarded by patents, the private sector has been largely absent from this line of research.” The U.S. aggressively promotes public-private partnerships with corporations such as seed and chemical companies Monsanto, Syngenta, DuPont, and BASF; agribusiness companies Cargill, Bunge; and Archer Daniels Midland; processed food companies PepsiCo, Nestle, General Mills, Coca Cola, Unilever, and Kraft Foods; and the retail giant Wal-Mart. I think we need a new kind of agriculture – kind of a third agriculture, between the big agribusiness, commercial approach to agriculture, and the lessons from organic and local systems…. Can we take the best of both of these and invent a more sustainable, and scalable agriculture? Last week I talked about the fears associated with feeding a world population of 7 billion – let alone 9 billion – and mentioned that there are those who see organic agriculture as a niche market, unable to provide the calories needed for those 9 billion. The topic is extraordinarily complex, and we can only begin to review various components that figure significantly in the equation. For those interested, I highly recommend the report published by The Government Office for Science (GO-Science), London, entitled “The Future of Food and Farming: Challenges and Choices for Global Sustainability”. The executive summary can be downloaded here. To begin our exploration, let’s figure out how much food we’re talking about. How much is enough? Today, according to the United Nations’ Food and Agriculture Organization (FAO), the world is producing enough food to provide every man, woman and child with 2,700 calories a day, several hundred more than most adults are thought to need (which is around 2,100 a day). Indeed, Josh Viertel, president of Slow Food USA, stated on the Atlantic Food Channel that in 2008, globally, we grew enough food to feed over 11 billion people. We grew 4,000 calories per day per person—roughly twice what people need to eat. Allowing for all the food that could be eaten but is turned into biofuels, and the staggering amounts wasted on the way, farmers are already producing much more than is required (to feed everyone in the world). 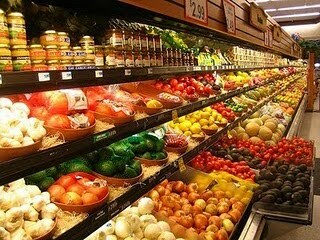 If there is a food problem, it does not look like a technical or biological one. Eric Holt Gimenez, of Food First (The Institute for Food and Development Policy) put it eloquently: “In 2008 more food was grown than ever before in history. In 2008 more people were obese than ever before in history. In 2008 more profit was made by food companies than ever before in history. And in 2008 more people went hungry than ever before in history.” But why are people going hungry if we have enough food to feed them? Amartya Sen, Professor of Economics and Philosophy at Harvard University and winner of the 1998 Nobel Prize in Economics, argued that the 1943 Bengal famine, in which 3 million people died from starvation and malnutrition, was not caused by a shortage of basic food – indeed, India was exporting food during the time that millions of its citizens were dying. It was, rather, caused by a bunch of other factors[i]. The primary reason, though, was that the poor couldn’t pay for their food: India was experiencing an economic boom which raised food prices, thereby raising the cost of food beyond the means of millions of rural workers whose wages didn’t keep up. 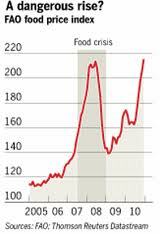 And the price of our food keeps going up: In early January, 2011, the U.N. Food and Agriculture Organization (FAO) reported that its Food Price Index had reached an all-time high in December, exceeding the previous record set during the 2007-08 price surge. Even more alarming, The FAO announced later that the December record had been broken in January as prices climbed an additional 3 percent – then in February they reached the highest level ever recorded. So if we accept Dr. Sen’s conclusion that food prices are the cause of hunger, what can be done to lower them? That answer – surprise! – is also extremely complex, including political conflict, poverty, harmful economic systems, and yes, climate change. To simplify things we’ll just look at one facet of the argument that goes like this: “ if output can be increased then food prices will moderate”. In the past, if more food was needed farmers just cleared more land, or they went fishing. Yet over the past 5 decades, while grain production has more than doubled, the amount of land devoted to arable agriculture globally has increased by only about 9%. In recent decades, agricultural land that was formerly productive has been lost to urbanization and other human uses, as well as to desertification, salinization, soil erosion, and other consequences of unsustainable land management. Further losses, which may be exacerbated by climate change, are likely. Some new land could be brought into cultivation, but the competition for land from other human activities makes this an increasingly unlikely and costly solution, particularly if protecting biodiversity and the public goods provided by natural ecosystems (for example, carbon storage in rainforest) are given higher priority. Recent policy decisions to produce first-generation biofuels on good quality agricultural land have added to the competitive pressures. So we’re going to have to produce more food on the same amount of land – probably less. And fishing doesn’t seem to be an answer: Virtually all capture fisheries are fully exploited, and most are overexploited. Recent studies suggest that the world will need 70 to 100% more food by 2050 . How to achieve that is hotly debated between those who support conventional agriculture (more and better technology) and those who think organic agriculture is a better way to deal with the long term problems created by this food crisis. You can’t argue the point without knowing a bit about the Green Revolution, since conventional agriculture looks to that model to support its argument. And that’s next week’s blog. J. Pretty, Agricultural Sustainability: Concepts, principles and evidence. Philos. Trans. R. Soc. London Ser. B Biol Sci 363, 447 (2008). J. Fargione, J Hill, D. Tilman, S. Polasky, P. Hawthorne, Land Clearing and the biofuel carbon debt, Science, 319, 1235 2008). [i] The government at the time was not a democracy, and the rulers had little interest in listening to the poor, even in the midst of famine. Dr. Sen believes that shortfalls in food supplies will not cause famine in a democracy because vote-seeking politicians will undertake relief efforts. So the famine was a combination of a myriad of factors: wages, distribution, even democracy.